Call of Duty: Modern Warfare 2 is one of the greatest games of 2009, offering players one of the best FPS experiences of all time. That game spawned a 2D remake, or a “demake” as it is called. Call of Duty 6 2D can’t be judged as a fully fledged game, but more of a homage to the work of Infinity Ward. 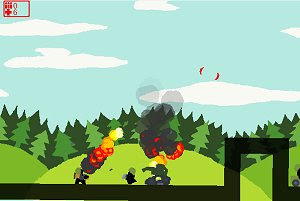 This free PC game takes the solo campaign from the official game and turns it into a side-scrolling shooter. The player will walk, shoot from a vehicle, drive a snowmobile, a helicopter, a boat and even enter the infamous airport level. All this in less than ten minutes! That’s right, if you don’t count the several times you’ll die trying to memorize the small levels, it takes just this time to be over with this remake. And that is why it can’t be taken very seriously, but more for a quick laugh. There are some nice touches in an otherwise simplistic game. The shells dropping to the floor and the colorful explosions are nice to look at, and the same can be said about the screen shaking with your bursts, but there’s not much else to say. Enemies tend to spawn near you, and that is terrible. I also had trouble with the jumping in the snow level (the diagonal jump just wouldn’t work), which caused me to die dozens of times in a row, but hopefully that won’t bother other players as much. As I said earlier, this is good for a laugh and you won’t regret the ten minutes or so you spent playing Call of Duty 6 2D. Just be sure to not expect much and you won’t be disappointed.